USA / Canada  2015  89m   Directed by: Steven Daniels.  Starring: Joe Lando, Michelle Stafford, Denyse Tontz, Andrew Elvis Miller, Brendan McCarthy, Diana Hopper, Evan Gamble, Raffaello Degruttola, Ben Levin, Pressly Coker, Jeff Doucette, Mark Rolston, Henderson Wade.  Music by: Emir Isilay. Will very, very quickly repeat what was said for the equally awful 'Destruction: Los Angeles', as what is about to be said applies for 'Earthfall' too. Just in case anybody wonders or is wondering, there is no personal bias against low-budget films. There never has been regardless of what people might think reading past reviews that have seen me be quite critical. There are good ones out there. Nor is there bias against disaster films, again there are some good ones, despite what has been said about some in the past. Even when taking it for what it is and what it tried to be, 'Earthfall' just does not work on any level. Not even for novelty value, because one is left feeling bored and insultingly frustrated to be getting any unintentional entertainment. Had absolutely no problem with it being made on a low budget with hasty time constraints and was expecting the production values to not be great as such, there has never been the mentality of if a film is low budget it is immediately bad. Not the case at all. It is when it looks and feels like those involved didn't try and that no effort, care or enthusiasm went into any of the components when it bothers me. That's how it felt watching 'Earthfall'. When a film is low budget and done in a short space of time, yet either may lack a little visually but comes off surprisingly well in most other areas or works on most levels and still also looks good (and there are numerous examples of both), it is proof to me that a film's budget shouldn't be an excuse for how the film overall turns out. 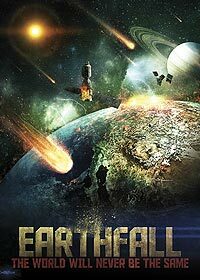 Taking the budget into account and knowing full well not to expect high art as it is not the type of film, 'Earthfall' is an example of a film that is so cheaply made you seriously question why they even tried. The editing is choppy and blurry, to the point of inducing nausea, and the special effects have a very fake and unfinished feel and would be more at home in a low-budget movie from twenty years ago. The scenery is too compact and there is a constant dreariness and lack of focus in the photography. Anybody fussy about continuity will have a field day spotting all the errors, 'Earthfall' is loaded with them. The music is intrusive and at odds with the mood and action with no exceptions. Direction shows no style or urgency, and a lack of control is obvious frequently too. The story is a major failing, there is no fun, tension, suspense or excitement, just non-stop dumbness, predictability and erratic pacing (both rushed and run of the mill that the film feels very blandly generic, lifeless and far-fetched). The disaster sequences are nauseatingly edited and have no thrills or suspense whatsoever where one never feels the extent of the damage, one is too busy being distracted by the bogus improvisatory-feeling science, dire at best effects, idiotic events and character behaviours as well as hitting their heads on walls in annoyance to get anything out of them. Furthermore, the script constantly feels awkward and almost as if the writers had little to no idea of how to make a film script make any kind of sense, give it any kind of flow, any kind of momentum or the ability to treat the audience with respect, so overboard the cheesiness gets. The characters have no development to them and infuriate in how stupidly and obnoxiously, with no logic in sight, they behave throughout. The acting is a mess of phoned in and over compensated with no exception, citing who gives the worst performance of the lot is hard as they are all as terrible as each other. Review by TheLittleSongbird from the Internet Movie Database.